We're rapidly approaching the end of my "season 2" of the Doom Patrol, though if I can find the issue that follows this one when I'm out at the comic store tomorrow, we might extend the season by a day. Mr. Straczynski gives us a very faithful take on the DP in this 21st century comic - the quips are there, the gripes, the near coming to blows, but also the camaraderie these three characters share. I'm not 100% sure this is in the right place chronologically (which is funny given it's a time travel story), as there's no mention of either Mento or Beast Boy. This might actually place the Doom Patrol era section a bit before issue #100. 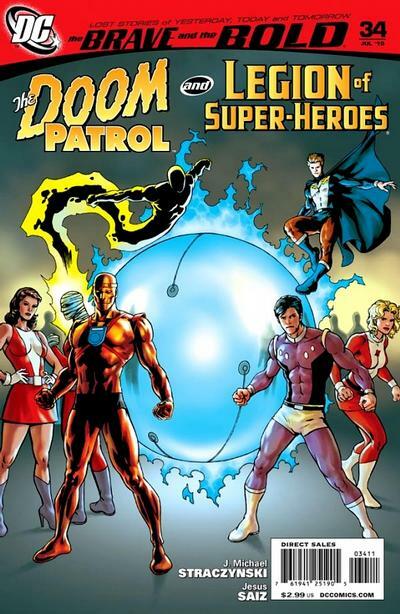 Regardless, it's the original four in the team, adventuring with the original three Legionnaires to save the Earth of the future from a primeval black hole. I'm curious about this series. I have a few other issues and it actually seems to be pretty cool. JMS is a fantastic comics writer. His Midnight Nation is fantastic, and his work on Amazing Spider-Man was very cool. I may have found another series (almost got all of The Warlord) that I need to track down.